The TX line is limited to 3.3V and so a 5V display can be used with a host that uses 3.3V logic. The TX line is open collector and so more than one device can be used on the same bus. It should also be noted that pin 15 on the LCD connector is the anode (+V). This may not apply to all LCD displays. Not all parts are needed for the I2C kit and so are not supplied. For I2C; T2,D1,R1 and R2 are not fitted. T1 is the transistor and has 3 legs, it also has a semicircular shape that matches the PCB markings. C1 may be a different colour but it is the only component with that shape. R1 Is marked with an orange stripe, that may look red, the actual colour stripes are black, brown, orange and gold. R2 & R3 are marked with a yellow stripe, the colours being black, brown, yellow and gold. D1 This is made of glass and so be careful when bending the leads. It MUST be soldered onto the PCB the correct way round, there is a black stripe at one end. Details of this later. Start with the socket first as this can be inserted and the pcb placed upside down to solder. There is a notch in the socket that should go to the left as shown. This is the front of the IC where +V and Ground are and the notch makes this easy to identify. Carefully bend the lead with the black stripe. Fit to the PCB with the black stripe at the top. The diode goes into the hole next to the socket as shown. It is important that this component is fitted the correct way round. Fit the rest of the small components, and then the trimmer. This is the completed PCB, note the orientation of the flat part of T2 which follows the markings on the PCB. There are two input connector options, one is for the P017, serial and the other is for the P018 I2C. Although pins have been provided for both it is probably better to just fit the one that matches the IC. Precautions should be taken as the IC is a bit static sensitive, no need to go to great lengths but a touch with a finger on a large metal object or radiator before handling is wise. The leads are normally splayed out so bend them in with the thumb against a hard surface that way the IC will fit into the socket better. It is easier to fit the pins to the LCD first, with the longer side going to the P017/8 PCB. This is a picture of a standard display that has 16 holes. Observe that pin 1 is to the left of the display looking at the back. The PCB is fitted as shown to a normal display. 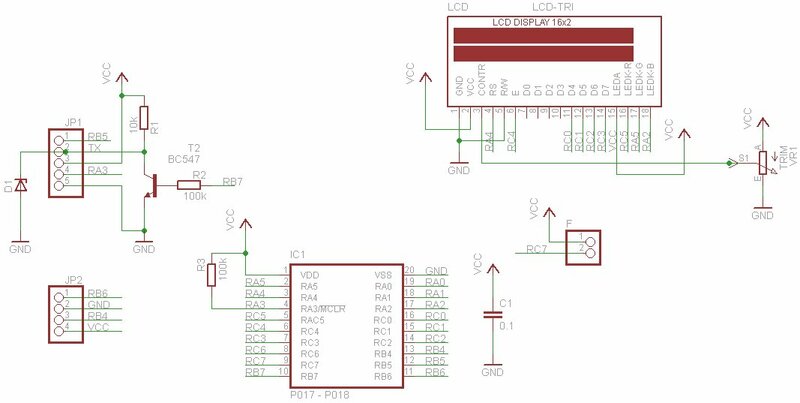 Make sure that you fit the input connecter either for the I2C or serial first, it will be almost impossible to do after. The two extra holes are not used on a normal display. These are for two additional backlights that can be found on LCD displays with a red, green and blue backlight. One last precaution; on all displays there are metal fixings so don't push the PCB on to these as it will short out. Leave the PCB high up on the pins or use tape or a small piece of foam (non-conductive) to separate the bottom of the PCB from the back of the display. This is the completed PCB for the I2C version. Note the orientation of the IC, for both versions the +V and Gnd go to the notch or the left hand side as shown.